Padraig Harrington will be more Hulk Hogan than Ben Hogan this week as the bids for the third leg of the Paddy Slam. The Dubliner revealed that he has been inundated with text's and emails from well-wishers but the message that really tickled his fancy was a wrestling joke from English rival Lee Westwood. Harrington beamed: "I've been getting the text messages and the e‑mails and the encouragement. I think the best one was Lee Westwood, who said, 'What's all this about the Paddy Slam? Are you starting up wrestling?'" Wrestling is just about the only sport that has not asked Harrington for help over the past two years. The Dubliner has given pep talks to the Irish rugby team, the Dubliner gaelic footballers and Olympic boxer Kenny Egan with mixed results. Ireland won the rugby Grand Slam for the first time for 61 years with giant lock Paul O'Connell confessing that Harrington's words made the hairs on the back of his neck stand up. O'Connell explained: "Padraig was invited to talk to us at our Christmas get-together by our coach, Declan Kidney. He spoke for two hours, and he was totally inspirational. "I've been a big admirer of Padraig's ever since he won the first of his back-to-back Open titles at Carnoustie in 2007. It was brilliant to see an Irish sportsman beating everyone on a world stage. "All week, he had been saying he was going to win, and I love that attitude. For too long in Ireland we have been 'cap in hand' when it comes to sport but now there is a greater sense of confidence." Egan won a medal in the Beijing Olympics after a talk with Harrington but the golfing ace is not taking his role as motivational speaker too seriously after the Dublin crashed out to Carlow in the 2006 O'Bryne Cup. He joked: "The Dublin football team and the Irish rugby team are equally enthusiastic about what I had to say. The Dublin team went out and lost to a very lowly‑ranked team the following week, and the Irish rugby team have had success. So, I'm at 50/50 at this stage. The next one could be pivotal." 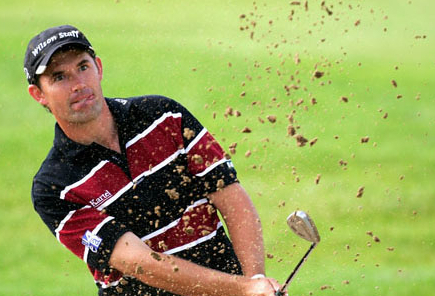 Padraig Harrington will be under doctors’ orders this week as he prepares his Major Championship masterplan for 2009. The Dubliner, 37, will sit down with his team of medical and technical gurus in Los Angeles for a brainstorming session that he hopes will give him an edge over rivals like Tiger Woods in his bid to complete the so-called "Paddy Slam". And Dr Liam Hennessy, the expert in sports physiology who oversees Harrington’s physical preparation, is hoping that they can come up with some new ideas that will give Ireland’s triple Major winner an advantage over the competition when he cranks up the machine in the New Year. Padraig Harrington has found the last piece of the jigsaw puzzle that will help him win the Masters this week - a trusty old driver. Padraig Harrington suffered more than his fair share of bad luck as he carded his third successive 73 in the Masters. 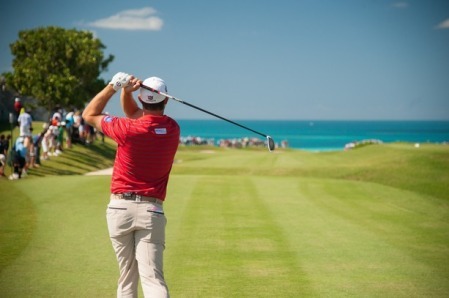 Padraig Harrington hits off the 15th tee at The Port Royal Golf Club in the final round of the 30th Grand Slam of Golf in Bermuda. (Photo by Montana Pritchard/The PGA of America)It was less than eight feet - the height of the average doorway - but if Padraig Harrington goes on to win more majors he may well look back on it as the putt that helped him walk back into the light again. Considering the venue, it might be more apt to say that he escaped his very own Bermuda Triangle.